OMGoodness,I can’t wait, just love your owls. Oh my goodness! How delightful! We once raised an owlet who we, of course, called “Hooty”. He was a barn owl so slightly different but I’ve always adored owls! I am so happy to hear you are going to make an owl pattern. I have tried to figure out how to do them for a long time and my attempts have been grim, and not in a good way. Really looking forward to the pattern. Just love your owls! oh but this is wonderful news! the owls who live around my house have been particularly talkative lately. I wonder if they already knew!?!!! I am loving these owls, especially Ian as I too love Mr McShane . 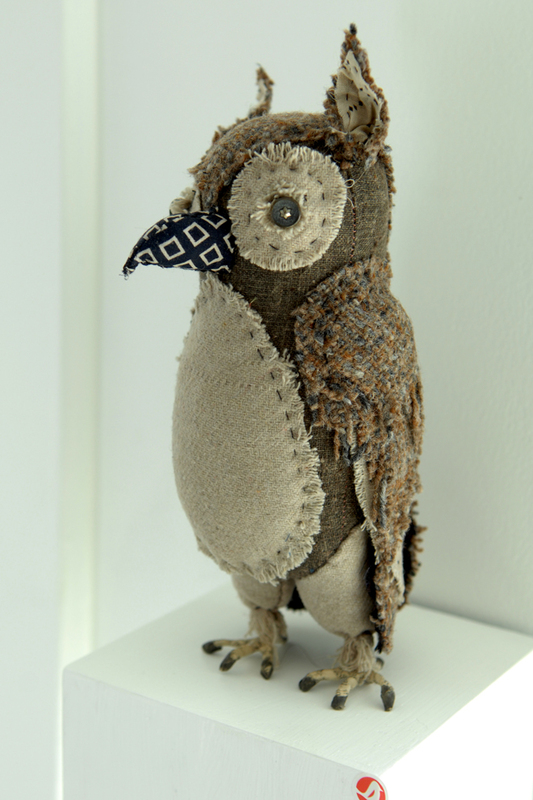 Your owls are the best…can’t wait for the pattern…owls are my muse to..
Love your owls. Look forward to seeing your pattern. Well, I just might have to get this pattern! It might be fun to have a few owls around the apartment! So excited! Can’t wait! LOVE your owls!!!!! Add me to the owl addicts group! Since discovering your site, the most-anticipated designs of yours have been the songbirds and owls–and now I’ll have both! And I know the best place to source old Victorian clothing in Woodstock, Vermont. I’m a happy woman! I look forward to the pattern too! And thank you for the link to Molly Meng and Robert Mahar, gosh I connect with her style so similarly and their collections came right out of my basement! Yay! Looking forward to the owl pattern! I was so intrigued by your story about your Mom’s encounter with that barn owl and then you didn’t say what that was? I’d love to hear about that! If the traveling to LA was not as terribly bad as it is, I would have gone to the French general to partake in your wokrshops. Yes, the great gray owl. I still remember that! Maybe the ships were inspired by the Sinbad The Sailor movies! At last! How I have wished, hoped and dreamed that one day you would ‘release’ your owls 🙂 I will be joining the line to pick this up when it’s available. November is going to be a Hoot! Oh, I can’t wait! I would also love to take one of your workshops if I could!!! Sooo glad that the owl pattern will be available soon. 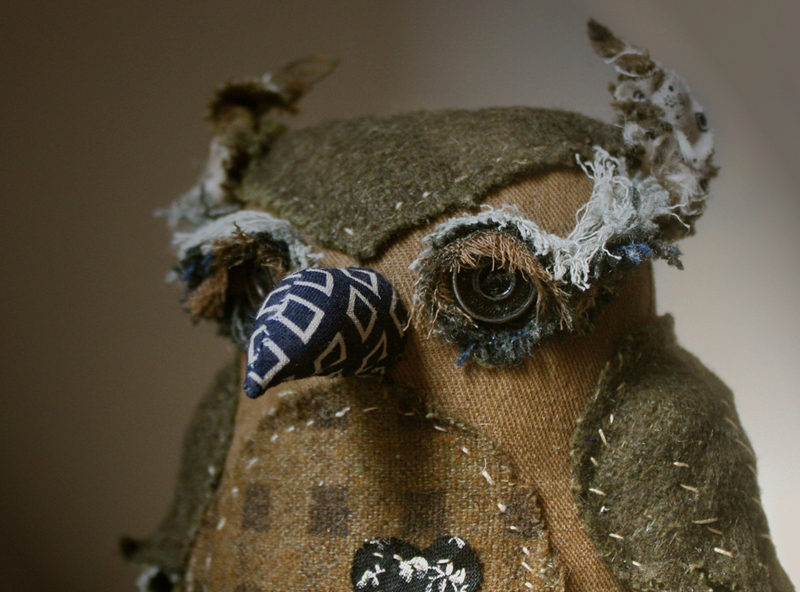 Several years ago I made the owl from “The Artful Bird” and it remains displayed prominantly in my home. He needs a dastardly friend. ”Sometimes I feel like I’m barely involved, as though they have been simmering in me all along and just waiting for their opportunity to appear.” -exactly as i feel also when i work on a new creature and the facial expression is always mystery, as if i don’t have avy control over it. love your owls and everything you do. thank you for letting us to have a peek into your world! 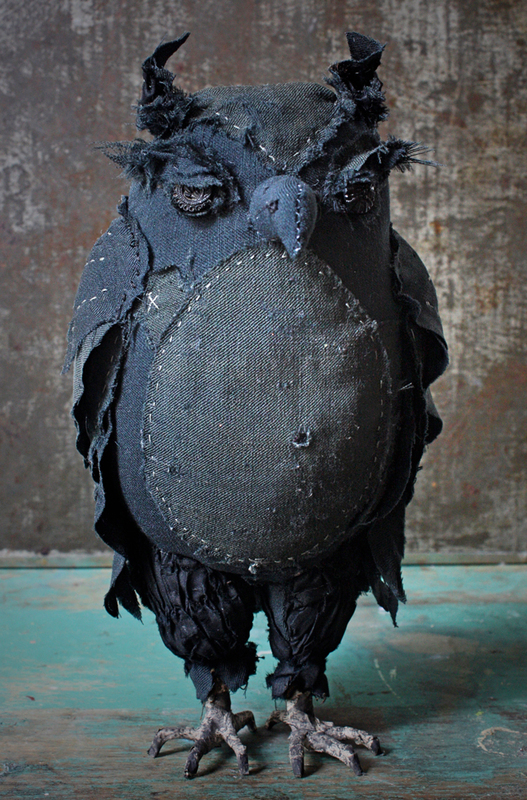 The old pictures of Dastardly owl in the making make me think of elephants. Do they figure in your make-world at all? Of all your owls, I really like the brown one best. I think I like the brown ones better, although I’m impressed by the dark and malevolent ones! LOVE the eyes on the second brown one pictured! Those shaggy eyebrows…! How wonderful! I would love to try my hand at an owl! Yours are absolutely enchanting and magical! Thank you for sharing these beauties! I can’t wait! I bought your bird pattern and have 2 in the making. One is only lacking the legs and feet. The other one I am having a problem with color (which wasn’t a problem with the first one). Love all your work! Can’t wait for this pattern! Your emails and creations always bring a very bright spot to my day! Thank you for sharing your adventures!!! 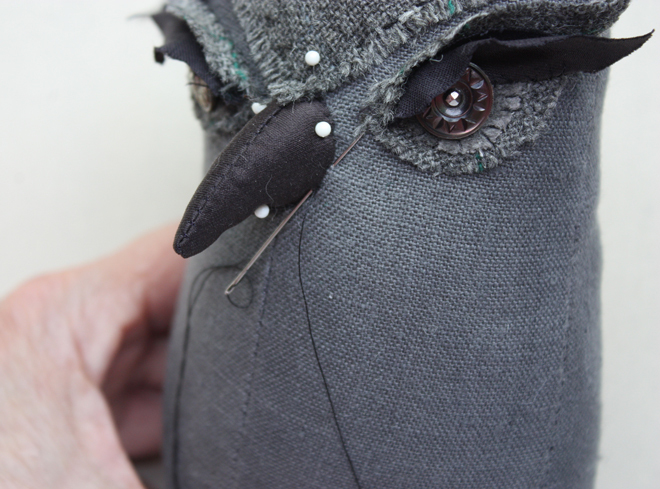 I just can’t wait for this dastardly fellow to become available in pattern form. It is now mid-November so hopefully it won’t be too much longer! Woohoo! Can’t wait for the pattern! I’ve been admiring your owls before I even realized they were yours! To one very Special Lady, who enchants everone that loves her work, we know who. Oh, and my own will have to wait, not a problem for me, as everthing comes to those who wait. Wow, just saw your owls on this rainy sundaymorning!! They both are gorgeous and the beautiful denim one is my favorite ❤️. Thank you, you made my day look less sad by showing them.